Cataracts are caused by clouding of the crystalline lens in the eye. The lens is made of water and proteins. Over time, the protein may clump together, forming a cloudy area. The area continues to grow, until it begins to obstruct the vision. Looking through a cloudy lens is like trying to see through a frosty or fogged-up window. 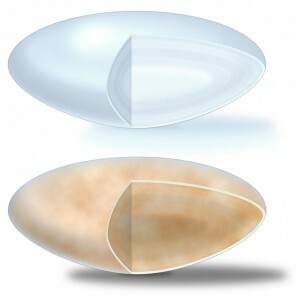 The pictures above demonstrate the clear crystalline lens on the left. 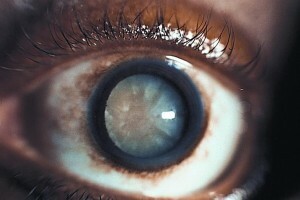 On the right, you can see the clouding and discoloration of the lens from a cataract. People with diabetes and those taking long-term steroid therapy seem to be at higher risk for developing cataracts. Studies suggest protecting your eyes from ultraviolet exposure may inhibit cataract formation, so most eye care professionals recommend UV protective lenses. However, almost everyone will eventually develop cataracts in their lifetime. Some cataracts can progress over many years, and are only considered “ripe” for surgery when they impair the normal functions of daily life, or when glasses can no longer improve the vision. Cataract surgery is generally a very safe, effective out-patient procedure. Surgery is usually performed on one eye at a time. Recovery is very fast, thanks to the advanced surgical techniques and “no stitch” incision. Usually daily activities can be resumed very quickly, with minimal restrictions on lifting and aerobic activity. Several options in the implanted intraocular lens (IOLs) are available. Most insurances, including Medicare, will cover the basic costs of cataract surgery. Premium options are also available.